Please note the new Open/Closed player restrictions for the 2018 CYC Volleyball Season. 1) Any CYC player that was registered and played with a USA Volleyball team during the 2017-18 USA Volleyball season is considered an OPEN player. 2) Any CYC player that plays volleyball during the CYC volleyball season is considered an OPEN player. 3) Any CYC player that was not registered and did not play with a USA Volleyball team during their 2017-18 season, plays in another league or in tournaments before and up to the start of our 2018 season, but then did not play until after their CYC season ended, would continue to be considered a CLOSED player. 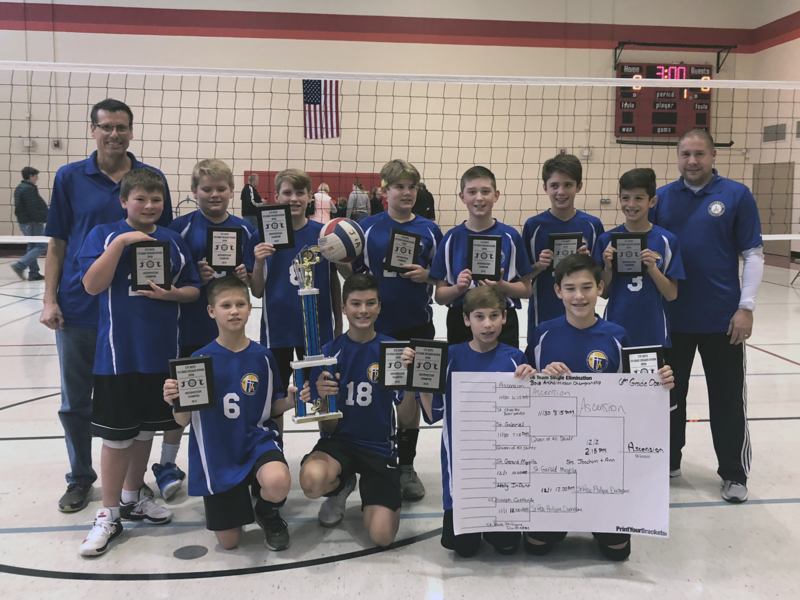 The goal of the Ascension Youth Volleyball Program is to develop a child's volleyball skills in a positive environment which promotes Christian values. All boys and girls, Grades 3-8, are eligible for participation in the volleyball program if the child's family is a registered Member of Ascension Parish, lives within the Ascension Parish boundaries, or attends Ascension School or Ascension PSR (unless your parish does not have a program). Eight or nine players are recommended per team. However, these numbers are only intended as a guideline. Your Volleyball Coordinator will do her best to ensure that your child gets on a team if registered by the deadline. Boys' games are typically played on Sunday afternoons/evenings. Some overflow games are played on Friday evenings. Girls' games are typically played on Friday nights or on Saturday mornings/afternoons. Some overflow games are played on Sundays. NOTE: Soccer and volleyball leagues do run concurrently. CYC will ensure there are no conflicts with the initial schedules. All participants must obtain a CYC ID card. It is ideal to get one for each sport played in the same season (volleyball, baseball, and soccer). You can securely apply for a CYC ID Card online at www.cycstl.net. All players are normally placed on the team from the previous year. All new participants will be placed randomly on teams based on team numbers. The goal is to balance the player count per team across multiple teams at that gender/age level. When possible, we use the comment section of the registration form to place individuals on teams in which they might have a friend they want to play with. Please know we will do our best but this is not a guarantee and a great opportunity for your kids to make new friends. Teams in Grades 5-8 may participate in the post-season West County CYC District playoffs and the CYC Archdiocesan Tournament. Eligibility depends on both division designation and standing within the division. Regular registration opens in May and will end June 30th. Late fees apply after June 30th, and placement on a team is not guaranteed. It is important to register on time to ensure your child will be placed on a team. CYC League (Grades 3-8): $100 per player. A $25 Sibling Discount will be given on all registrations after the first family member. This discount will be taken when you checkout, if it applies. The Ascension Volleyball Program will provide team jerseys for all players. All jerseys must be returned to the head coach at the end of the season. Please follow the care procedure provided by your coach and remember that these jerseys will be used by others in future years. Only wear the jerseys for games and not as play clothes. Also, please change before eating or drinking as stains are very difficult to remove. A fee may be assessed for damaged jerseys at the discretion of the Athletic Association. Parent Participation - Helps with the Success of Our Program! All parents are encouraged to volunteer in our Volleyball Program as a Head Coach, Assistant Coach, Team Manager, practice/game helper, or party organizer. If your team already has a Head Coach, please ask him/her what you can do to help the team. Or contact the appropriate Volleyball Coordinator for details on how to help. Parent Participation helps with the success of our Volleyball program!